Transtar is very excited to provide you with the industry's leading solution for all of your programming needs. RAP®2 is the solution for you! What Is Remote Assisted Programming? The Remote Assisted Programming kit includes a tablet, the vehicle interface, an OBD-II connector, and a 4G dongle. #1. Schedule for the next available appointment. #2. Choose a later time that works better for you. Subscription to Diagnostic Network included! A 90–amp battery maintainer** capable of handling European amperage requirements. Metal Screws: to swap out for existing screws (plastic ends) for repeatability. RAP®2 is rented to you for $49.95 per month, but if you use your kit two or more times each month we’ll waive the rental fee for that month. You are only charged $125 for each flash! You must follow the instructions of the remote technician. There can be no other inherent problems with the vehicle, such as faulty ground connection or an aftermarket accessory that is interfering. In such case, you will be responsible for the cost to rectify the problem. The guarantee is not offered for salvage, rebuilt, flood, or total loss vehicles. Register to receive your FREE RAP 2 Kit Today! How do I get a Remote Assisted Programming Kit? Can I exchange my Original RAP Kit for a NEW RAP 2? - Call 877.888.2534; Option 5. - Upon receipt of the RAP®2 kit, place the original RAP®kit in the same box and ship to Drew Technologies. - 1996 - 2009, up to and including the 3500 series: ECM/PCM/TCM updating only. No module replacements. - 2010 and newer, up to and including the 3500 series: All module updates and replacements. - No support for 5.9L Cummins updates. - Module/system examples: ECM, TCM, PCM, BCM, Brake Pedal calibration, ABS initialization, etc. - J2534 module programming, key programming and associated configuration, setup and security functions: $125.00 each. - Module calibration check: $40.00 each. - 1996 and newer emission module updating & replacement for vehicles 1996 and newer. - Emissions module configuration as supported by Ford FMP on vehicles 1996 and newer. - Key programming up to model year 2013 vehicles. - Diesel FICM module replacement and programming. - No support for Low Cab Forward (LCF) vehicles. - No modules updating or replacement on K-Line (Pin 7 on DLC) and medium speed CAN bus (Pins 3 & 11 on DLC). - Module/system examples: ECM, TCM, PCM, ICM, SRS, ABS, Keys, etc. - 2001 and newer (some exceptions) updating & replacement. - 2001 and newer updating & security functions that are supported by the GM Service Programming System. - Module/system examples: ECM, TCM, PCM, ABS, BCM, EBCM, HVAC, ICM, SDM, TCCM, Keys, Fast Learn, etc. - Module configuration, setup, and security functions for all modules supported by GM Tech2Win. - Module configuration, setup, and security functions for all modules supported by GM GDS2. - All Infotainment ECUs (SAT NAV/RADIO/AMPLIFIER/CD/DVD) Coding Only. No module updating or replacement. - All Bluetooth / Telephone ECUs. Coding Only. No module updating or replacement. - 2007 and newer existing module updating only. - Key Programming: Coming soon!. - Module/system examples: ECM, TCM, PCM. - J2534 module updating: $125.00 each. - Old TCM must be available and communicating (must remain installed and Drewtech will direct customer when to swap out). - Excludes the CVT transmissions and the early 112/113 engines with engine control units ME2.8. - Used and re-manufactured modules not permitted. - Note: Service is available for existing CVT module updates only. Replacement CVT modules cannot be programmed. - 2004 and newer powertrain (ECM/TCM) module updating. - 2005 and newer powertrain (ECM/TCM) module replacement. - 2005 and newer rear-wheel drive (RWD) valve body programming. - J2534 module updating, programming & RWD valve body: $125.00 each. - New module programming. Used and re-manufactured modules not permitted at this time. - Module/system examples: ECM, TCM, PCM, BCM, etc. How do I return a RAP Kit? It’s $20 for a return tag from Drew Tech. It’s $30 for a return tag and pickup call scheduled by Drew Tech. Do I Need To Add Fluid To The Transmission Before Programming With A RAP Kit? Yes! Completing the full programming procedure requires us to work the transmission. While a unit without fluid won't adversely affect the programming itself, it will affect the set-up procedures that we need to do to finish the process. Can I Program Modules Beyond the TCM? Yes! Our RAP Kit allows you to program modules and systems that extend beyond just Transmission Control Modules! 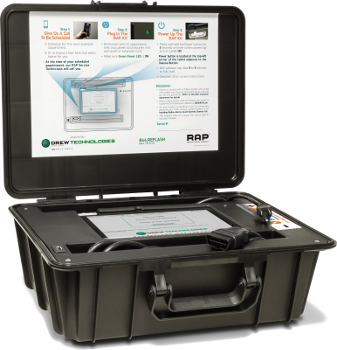 CLICK HERE to view a full list of the programming capabilities of the RAP Kit. I called for my appointment, but Drew Tech said I’m on hold. What does that mean and what do I do? Active: (Account current/Valid Payment method on file): appointments can be made without any payment restrictions. Inactive (Updated CC needed for Account, i.e. : CC on file is no longer valid/open charge(s) on Account): appointments can be scheduled, but a CC is required at the time of service to update the account and process open payments. Service will not be provided if the customer does not provide a CC. Scheduling: Customer is advised at time of scheduling an appointment that a CC will be required at time of service. Fulfillment: Customer is required to provide a CC at time of appointment for service. - If the customer provides an updated/valid CC, the appointment service proceeds. - Cancelled and customer is directed to schedule a new appointment when they have a CC available. Inactive (60+ Days Past Due)): appointments cannot be scheduled until account payment information is updated and delinquent payments are made whole. Customer is forwarded or may contact RAP Billing, 734-222-5228 x 752, for resolution. Account on Hold-Contact Distributor (hold placed by Transtar): appointments cannot be scheduled until Drew Tech is notified, by Transtar, to activate the account. Customer is advised to contact their Transtar representative.